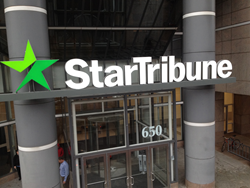 StarTribune Moves Corporate Headquarters. Custom Signage From Nordquist Sign. StarTribune looks to the future as it moves into a new contemporary office building in downtown Minneapolis. After 95 years at its previous location, the media company is updating its image and selected Nordquist Sign to help with their branding. Nordquist Sign fabricated and installed the entry sign facing Third Avenue. The manufacturing expertise of the Nordquist team involved implementing a design and installing the sign to the two existing structural entry columns. The projecting sign was constructed with a horizontal aluminum support system and the letters are custom manufactured from stainless steel and house a low voltage LED lighting systems. The new Star Tribune logo is a translucent custom printed graphic. “When the Star Tribune had a once-in-a-generation opportunity to bring its brand to life at the new Star Tribune Building, we turned to Nordquist. As they have many times over the years, they managed the project with attention to detail and delivered a top-notch finished product. The proof is in the countless compliments we receive from visitors and neighbors, and the pride our employees feel,” said Steve Yaeger, Chief Marketing Officer and Kevin Desmond, Senior Vice President Operations. “Nordquist Sign’s client relationship does not end with the installation of the sign. Our goal is to stay in contact to ensure each client is provided with any necessary service and to advise on any future branding needs,” said Steve Hirtz, Senior Vice President of Sales for Nordquist Sign. Lawrence Sign, founded in 1929, designs, fabricates and installs signs for almost every industry servicing local, national and international clientele. Lawrence Sign utilizes advanced technologies and expansive facilities to provide direct in-house control of the entire sign fabrication process. The Company excels at serving companies with a multi-site national and international presence. Nordquist Sign has been fabricating and installing interior and exterior signage, architectural elements and way-finding signage for more than 100 years. Nordquist’s customer base and scope of work includes custom signage and environmental graphics for hospitals, sports facilities, themed entertainment, corporate/financial and mass transit industries. Nordquist Sign also maintains a gaming division with offices in Las Vegas, NV and St. Paul, MN to serve casino gaming markets throughout the United States. In early 2012, Lawrence Sign combined with Nordquist Sign to unite the unique resources and capabilities of the two companies. Together, Lawrence Sign and Nordquist Sign offer their clients more than 175 years of experience in sign manufacturing and installation for all facets of the signage industry.